The Textured Crochet Headband is my crochet fix to a bad hair day! Throw on a super cute headband to hold down or hold back those stray hairs that just do not want to cooperate. It also is a great project to cheer you up on a bad day. You can finish this project in just one sitting and then wear it the next day with pride! 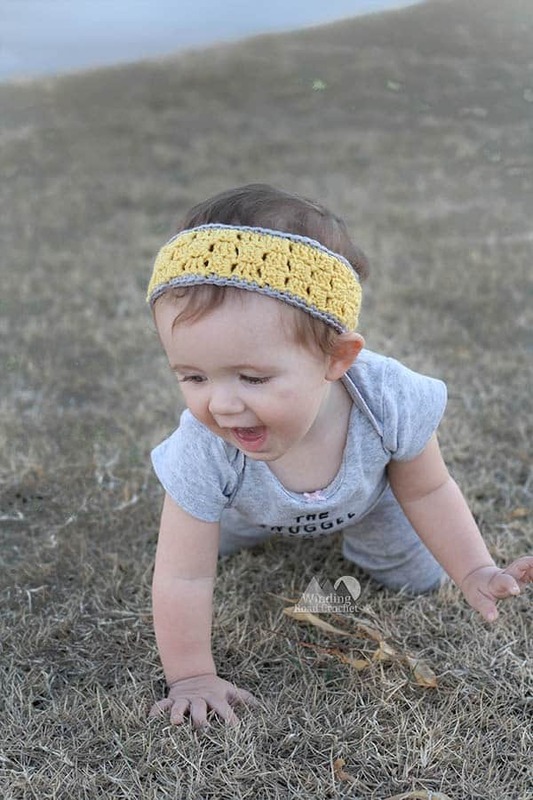 The Textured Crochet Headband uses the corner to corner crochet method in a rectangle shape to create a quick hair piece. If you are not familiar with the Corner to Corner Crochet Stitch, then check out my full tutorial. This project is actually on of the practice projects I designed just for this tutorial. Now I will provide you a pattern below but I will also walk you through the process with a tutorial so that you can adjust this headband to fit any size head or to be as thick or thin as you want. Also use what ever yarn you would like to use with an appropriate size hook. The tutorial will still work for you. I used Red Hearts Chic Sheep because I love the stitch definition. This project takes very little yarn. If you love to Crochet, check out all my Free Crochet Patterns here and come of my favorites below. This post may contain Affiliate links. For more information refer to my Disclosure Policy. As you will see when you do the tutorial, gauge will not be important. You will work until the head band is as long and as wide as you want it. But for those who want it, my gauge was 2×2 square = 1 inch using the C2C stitch. The size will vary based on how you make it. To start you will need to use the Corner to Corner crochet technique to increase until the headband reaches your desired width. Increase Row 1: Dc into the 4th, 5th and 6th Ch from the hook. Increase Row 2-? : Ch 6, Dc into the 4th, 5th, and 6th chain from the hook. (Slst to the turning chain of the previous row, Ch 3, Work 3 Dc around the turning chain you Slst to.) Repeat from (to) to the end of the row. I also made a earwarmer that is 5 squares wide by increasing for 5 rows. How wide you make it is completely up to you. From this point you will begin making your headband longer but not wider. We do this by alternating increasing and decreasing at the beginning of each row. Rectangle Row 1: Turn, Slst to the last 3 Dc of the previous row, Ch3, turn. Work 3 Dc around the turning Ch of the previous row, *Slst to the next turning Ch, Work 3 Dc around the turning Ch of the previous row,* repeat from *to* until you are even with the top of the previous row. Rectangle Row 2: Ch 6, Dc into the 4th, 5th, and 6th chain from the hook. (Slst to the turning chain of the previous row, Ch 3, Work 3 Dc around the turning chain you Slst to.) Repeat from (to) to the end of the row. Continue Repeating Rectangle Rows 1 and 2 until the Headband reaches your desired length. How many rows this will take will vary based on your gauge it is just better to use a measuring tape to measure the length to determine when to stop. You will want your Textured Crochet Headband to be about 1 – 1 1/2 inches less then the circumference of your head. With my gauge I would work 40 rows for an adult headband, 36 rows for a child’s headband and 32 rows for a baby’s headband. Now we will square off the end of the headband by decreasing at the beginning of the last few rows. Decreasing Row: Turn, Slst to the last 3 Dc of the previous row, Ch3, turn. Work 3 Dc around the turning Ch of the previous row, *Slst to the next turning Ch, Work 3 Dc around the turning Ch of the previous row,* repeat from *to* until you are even with the top of the previous row. Repeat the decreasing row until your headband has a complete squared edge. If your Textured Crochet Headband is 5 squares wide, you will repeat the Decreasing Row 4 times. 4 squares wide will need 3 rows of decreasing to finish it off and so on. Once your headband is squared off just Fasten off leaving a long tail to wipe stitch the two ends together. I added a single crochet edging to my daughters headband but left it off my own so you can see what both look like. You can learn how to add a Single Crochet border to the Corner to Corner Crochet stitch in the video below or in the Corner to Corner Crochet Tutorial. Once you join the ends of your headband and decide if you want a border or not your Texture Crochet Headband is complete. If you want to give the headband a more unique look, check out the three ways I finished my Plaid Earwarmers. What color hat will you choose for your Textured Crochet Headband? Let me know in the comments below. I would really like to see your finished crochet project, take a picture and share it with me on any social media! Just tag me @windingroadcrochet, #windingroadcrochet, or #ourcrochetjourney. Join my Facebook Group and share your creation with the community at Our Crochet Journey Facebook Group! Written pattern, tutorials, graphs and pdfs of the Textured Crochet Headband are copyright Windingroadcrochet.com. Please do not reprint or repost this content as your own, but please feel free to share this link with others. You can find more information on sharing my work with others in the Terms and Conditions Page. Your daughter is so cute. I like the headband. Ty for the pattern.